All transactions are safe and secure with a reliable history in online purchasing behind each of our associates. 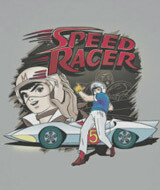 Buy the Vintage Speed Racer Victory Wave t-shirt to own Speed Racer clothing and merchandise. This officially licensed grey victory wave Speed Racer t-shirt is the perfect gift for the Speed Racer cartoon fan in your family. The faded design looks great against the grey color of the tee. Speed is shown giving his victory wave as he acknowledges the crowd after a big win against Racer X. Pair this with the bestselling Go Speed Racer Go shirt from the gallery for the perfect gift combo. Include a Speed Racer diecast car and costume for the ultimate fan. In addition to the Vintage Speed Racer Victory Wave tee above, browse the Speed Racer Clothing Gallery for more apparel like men's and women's clothes, kids shirts or hoodies.